29 June 2015 | Wyoming is a land of wide skies and open fields – of country-sized ranches, ugly energy pits, and massive wind farms. It’s also one of 11 US states and 2 Canadian provinces where the humble (and going-extinct) greater sage-grouse resides. Like the people of Wyoming, the sage-grouse likes its space – it needs 230 square miles to thrive – and that’s the problem. While the sage grouse can live alongside cattle and other grazing animals, it perishes in the fragmented habitat left by farming, energy development, and urban expansion, according to the US Fish and Wildlife Service (FWS). These threats, combined with other perils like invasive plants and wildfires, are driving the sage grouse toward extinction. The FWS listed the sage-grouse as a candidate species under the Endangered Species Act (ESA) with plans to announce a listing decision in September. Because an ESA listing intends to bring a species back from the brink of extinction, the regulations are rigid. 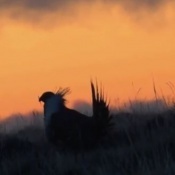 Western developers worry an ESA listing on a species with such a wide range will severely deter economic growth, said Theo Stein, a Public Affairs Specialist for sage-grouse at the FWS. In an effort to proactively conserve and restore the sage-grouse to healthy populations without ESA regulations, the Sweetwater River Conservancy (SRC) opened the first conservation bank for the greater sage-grouse in March. Although it contains just 55,000 acres of prime sagebrush, the Conservancy owns 700,000 acres, a land mass the size of Rhode Island that spans three mountain ranges. The bank has plenty of space to expand should demand for sage-grouse credits require it. The greater sage grouse’s requirement of large amounts of contiguous prairie also makes the SRC’s bank the largest in the US. Aside from the relatively new conservation banks for another grouse – the lesser prairie chicken – species banking is typically done on smaller scales involving animals that don’t require as much space. It’s important to conserve on the proper scale, said Brian Kelley, a wildlife biologist at the Conservancy. “Instead of an acre here and 50 acres there, this sage-grouse conservation bank could signal a paradigm shift in the way conservation is done,” he said. “Greater sage-grouse is a species that doesn’t like change,” said Stein. Nevertheless, the bird has struggled with an altered landscape for over a century as its historic range has been cut by over half, according to the Bureau of Land Management (BLM). Once numbering in the millions, the Department of Interior population estimates vary from 200,000 to 500,000, which is roughly a 30% decline since 1985. The only reason the bird wasn’t listed in 2010 was because the FWS said it lacked capacity to implement the listing status. Western interests saw this as an opportunity to thwart a listing. They launched a massive proactive conservation movement that spanned energy companies, federal and state agencies and ranching and farming operations. Wyoming was one of the leaders, Stein said. It set up a state-wide conservation strategy that includes prime habitat spots preserved for conservation known as core areas. In this pro-sage-grouse political climate, Jeff Meyer, SRC’s co-founder and Managing Partner, purchased thousands of acres in central Wyoming with the intention of building a wind farm. He was correct in thinking the region has vast potential for wind power, Stein said. But what he didn’t realize was the spot was also right in the middle of a core area for sage-grouse conservation. And renewable energy is part of the energy development that harms the bird, according to the FWS. SRC then switched to establishing a conservation bank. Initially, the company had performed intensive high-tech data-collection on the property to determine its wind power potential and found the land had great potential to generate mitigation credits. Also, this region of Wyoming is home to a number of historic cattle ranches. SRC soon realized that pastureland, if managed sustainably, could operate in harmony with sage-grouse populations. “The nature of the ranch landscape really leant itself to what this species needs: big, open and un-fragmented land,” said Kelly. This means the bank requires grazing management plans that incorporate both livestock production and sage-grouse goals with activities such as vegetation monitoring factored in. Keeping the ranches in operation is an important part of the bank’s success because it incorporates local interests, Kelly said. “Open spaces are important to Wyoming residents but maintaining their economic base is important also. A bank fits into this nicely because it allows for open space and for economic development through mitigation,” he said. The sage-grouse bank is opening up for business with roughly 32,000 credits to sell. “The next step is attracting clients,” said Stein. The question of demand for these credits is a major one. A candidate species listing drives some demand, but an ESA listing drives most of it, said Mark Sattelberg, the FWS Wyoming Field Office Supervisor. However, new incentives are springing up. Wyoming’s sage-grouse conservation strategy follows the mitigation hierarchy, according to its summary document, where development is encouraged outside core areas and requires mitigation for all projects that must occur within habitat strongholds. On top of the state-wide mandate, the BLM and the Forest Service recently released an updated version of its sage-grouse conservation efforts. Included in it is a mitigation component requiring developers follow the mitigation hierarchy and compensate for unavoidable impacts. This is significant because together the agencies manage two-thirds of sagebrush lands. And last year, the DOI launched a new mitigation strategy referencing the hierarchy and calling for landscape-level activity. Environmental NGO The Nature Conservancy’s announcement to establish a sage-grouse conservation bank in Nevada in partnership with gold mining company, Barrick Gold, is further evidence of a blossoming market for sage-grouse credits. The Environmental Defense Fund’s-another environmental NGO- habitat exchanges are also in the works in Colorado, Wyoming and Nevada. These ventures focus on land management incentives to ranchers in exchange for sage-grouse conservation. Sattleberg said he knows of three ranchers looking into conservation banking. “They’re looking into what it would take and it takes quite a bit upfront,” he said, noting interest from some ranchers will remain as interest and nothing more. At the core of all these conservation measures must be quality and they must deliver a net-benefit for the species, said Deborah Mead, the National Conservation Banking Coordinator with the FWS. “If these initiatives aren’t established to compensatory mitigation standards, then you have to ask if the species still warrants a listing,” she said. And while this will surely frustrate those involved in the voluntary proactive activities, the interest of the species must be put first, she said. It’s an important point to make with the various versions of conservation offered. If the FWS decides the sage-grouse does require a listing status, the current conservation activities will be assessed or re-assessed through an ESA lens, Mead said. “It’s good that people are getting out in front and taking voluntary actions on the landscape, but it should be clear whether these actions meet regulatory standards or not,” she said. At any rate, Eric Holst, Senior Director of Working Lands at EDF, said the momentum for conserving the sage-grouse is a positive thing. “I see this as an opportunity to assemble the federal and state agencies, energy interests and other private-sector parties together to grow sage-grouse populations,” he said.